You may need to click on it to enlarge it. 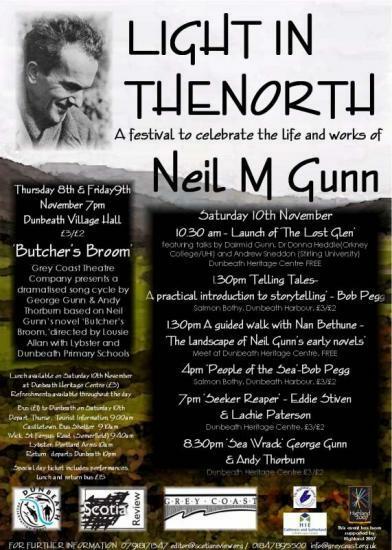 Three Caithness organisations have joined forces this year for a three-day festival called 'Light in the North - a Celebration of the Life and Work of Neil M. Gunn' in Dunbeath, Caithness (8-10 November). Although the event, hosted by Dunbeath Preservation Trust, has happened annually since 2002, the Year of Highland Culture 2007 has provided funding to create a stunning programme for 2007. On 8th and 9th November, Grey Coast Theatre Company opens the festival, presenting pupils from Dunbeath and Lybster primary schools in 'Butchers Broom', a dramatised song-cycle with lyrics by George Gunn and music by Andy Thorburn of Blazin' Fiddles, based on Neil Gunn's great novel of the Highland Clearances. As George Gunn says, 'The best way to understand the past is to have the children sing it. This is what Grey Coast's production of Butchers Broom does.' Louise Allan, originally from Wick, directs. Saturday 10th November has a full and varied programme organized by Scotia Review. A new edition of Neil Gunn's novel, 'The Lost Glen' has just been launched by Whittles Publishing Ltd. Dairmid Gunn, nephew of Neil and writer of the introduction to the novel, will introduce two other speakers. Dr Donna Heddle from the University of the Highlands and Islands (Orkney College) will contemplate 'The Lost Glen', Neil Gunn, and Cultural Space', while Andrew Sneddon from Stirling University chooses for his theme 'Neil Gunn, Nationalism, and the Politics of 'The Lost Glen'. In his workshop, 'Telling Tales' - a practical introduction to storytelling, Bob Pegg will use the brilliantly atmospheric salmon bothy at Dunbeath harbour to teach traditional storytelling skills. Where to find new stories; how to build up a personal story repertoire; ways to help you remember stories; finding suitable places and creating new opportunities for storytelling; making contact with an audience, and ways to break the ice; creating a storywalk for your area; using your personal talents to enhance your storytelling. He will follow this with his own new show, 'The People of the Sea', a treasure chest of stories, music and song, inspired by David Thomson's celebrated book, also called The People of the Sea, (1954). For those who want to walk the landscape Neil Gunn wrote about, Nan Bethune, chair of Dunbeath Preservation Trust will guide readers through 'The Landscape of Neil Gunn's Early Novels'. During the evening, Eddie Stiven's 'Seeker Reaper' is a dramatisation of the tales and reminiscences of the ring-net herring fishermen - illustrated by Lachie Paterson with rare slides and old film, accompanied by the music of the sea - and incorporating George Campbell Hay's great poem in praise of the boats in which they sailed. Finally, with 'Sea Wrack' George Gunn and Andy Thorburn return to round off the festival, this time with a performance of their own original poetry and music, built round the theme of the sea. Light in the North is a tribute to a giant of Scottish literature in his home township. In his turn, Neil Gunn would surely applaud the creativity on display during this weekend. There will be a special bus from Thurso-Dunbeath via Castletown, Wick and Lybster on Sat. 10th November. It will return to Thurso on the same route at the end of the day. Caithness Arts will be presenting a mini 'Festival of Drama' early next month. Grey Coast Theatre Company will be spearheading the festival with a new play from Caithness writer George Gunn. After 17 years and more than 35 productions, George Gunn is stepping down as Artistic Director of Grey Coast Theatre Company. George founded Grey Coast in 1992 to produce theatre which is relevant to the culture of the North, to promote new writing for the theatre in the North and to bring the culture of the North of Scotland to the rest of the country through locally produced theatre. SCOTIA REVIEW at Tempest Surf Caf�, Thurso Harbour Wed. 3rd December [AT] 7.30pm - FREE WRITERS READING Come and listen to some of our work. LIGHT IN THE NORTH 2008 - a celebration of the life and work of Neil M. Gunn Sat. David Anderson is starring in 'Mobile' touring in the north next week. Dave Anderson well known for his role as the bank manger in the TV comedy series 'City Lights' delivers a show ful of humour and one liners. Saturday 1st November 2008 Dunbeath Heritage Centre, Caithness. Come at 7.30pm to book a slot - Otherwise just turn up with a song, poem, tune or story. Comm Bar, Thurso 6th November from 8.00pm Writers 7.30pm to book a slot. St Fergus Gallery, Wick Wed. 19th September 200 - 7.30pm Part of Caithness Arts Festival 2007 As Caithness Arts Festival 2007 nears its second week, Scotia Review prepares for its third event during the cultural whirl.